A long-time My Theatre-favourite, Mike Shara has become one of Stratford’s most reliable leading men. He’s a consistent charmer and master comedian whose turn as Cornelius Hackl thoroughly stole The Matchmaker from the likes of some of the country’s biggest names. One of our Best Actor in a Play nominees this year, Mike found the time to talk to us about his many great roles and his hopes for the upcoming season (mainly to escape the inevitable wig in The Three Musketeers). My first experience with theatre was at the Shaw Festival. I grew up in St. Catharines, right near Niagara-on-the-Lake, and they had a need for two kids to be in a production of a play called Cavalcade. I’d never done drama or anything like that, but I went to that audition. I could do a British accent, a little bit—I kind of impersonated John Cleese, to be honest with you. And that was it. So I got a job there, and was with a bunch of great people, it was a great show, and that was kind of my first gig with it. Describe your first day of rehearsal at the Stratford Festival. [Laughs]. Uh, intimidating? How’s that? 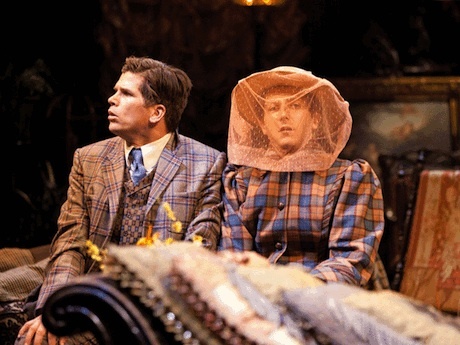 My first day was for The Importance of Being Earnest with Brian Bedford, who I didn’t know—other than from an audition. Luckily, I had Ben Carlson there, who’s an old friend, so that helps. I didn’t really know Stephen Ouimette, or many other people, but I knew Andrea Runge a little bit. So it was intimidating, but very soon it became very fun. I was really sure my first year at Stratford would be a one-and-done kind of thing. I didn’t suspect I would stay. I didn’t think they’d want me to stay. I thought I was just sort of going to be a good fit for Earnest and Cyrano, but I was pleasantly surprised at how much fun I had, and that’s why I’ve stayed as long as I have. 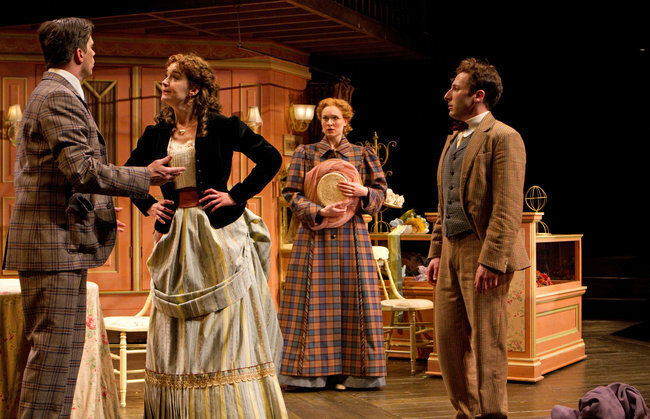 You were really established with the Shaw Festival when you left to play Algernon in Stratford’s Earnest. Were you recruited to switch festivals to do that part? Well, no, I wasn’t “recruited”. I don’t think Brian had any idea who I was. I think they did an audition for it, with people who didn’t work at the Festival at the time, you know, they sort of cast a net out, and I was one of the people whose name—somebody must have known and come up with—but I certainly auditioned. And I had to audition early, and Brian came to see a show I was in, because he didn’t know me at all. I wasn’t headhunted or anything. Though, it was a good fit, you’re right. I felt like it was a good chance for me to go to Stratford, because it was a part I thought I could do well, but it certainly wasn’t offered to me right away or anything, no. Have you always been more comfortable with things like Wilde, as opposed to Shakespeare? Well, Shakespeare’s catching up. But yeah, I really hadn’t done any Shakespeare until I came to Stratford. So I’ve had a lot of catching up to do. I didn’t really know if I would like it or not, and kind of suspected I might not like it, but actually have enjoyed acting it. I’ve enjoyed the challenges of it—of presenting it in the 21st century. Much the way I’ve enjoyed doing Shaw—the challenges of it, for a 21st century audience, are pretty unique. It’s fun to try to make those things make sense. The first thing I ever saw you in was Cyrano. I love Christian, he’s one of my favorite characters, but oftentimes people don’t really take to him because he’s standing directly in the way of the hero and the woman he loves. Can you talk a little bit about trying to find the humanity in him and trying to make him a lovable character? That’s a good question. I’m trying to remember now. That was a few years ago . I think what I remembered thinking at the time was that—I think Christian was and is smarter than people give him credit for. You know, people think—because he’s talked about as being so handsome all the time, and because he’s not good at speaking, necessarily, to a woman—that he’s stupid. And I didn’t think he was stupid. I thought he was smart, just not good with girls, you know what I mean? Not gifted in that regard. And that helped because I think oftentimes he can be played kind of, as vapid or empty, or a bit thick. And I don’t think he is. I think he’s shy, but he’s not stupid. And that was a big window in. I’m trying to think what else occurred to me while that was happening. Also, the truth of it is, a lot of that comes from Colm [Feore, who played Cyrano]. Colm was very generous about not [treating Christian] as some kind of unlikeable villain. Colm was really generous to me, and really wanted to play with me out there. We became friends and that sort of played on stage too, I think. Where I suppose that could be an adversarial relationship—both on and off stage— that wasn’t the case with us at all. He was very kind and very generous to me. You’ve actually gotten quite a few parts like Christian at the Festival- characters who are known for being very handsome but maybe not considered the smartest of guys. For example, the young shepherd in A Winter’s Tale. Why do you think that keeps happening? Well, [laughing] I don’t know why. You’d have to ask somebody with a higher pay grade than me. I think probably because I’m not afraid to ask dumb questions in a rehearsal hall, and I’m not afraid to play low status. Even though, whatever, I can be cast as a sort of, “handsome guy,” I’m not afraid of looking foolish or things like that. I don’t know. You’d have to ask somebody who does casting there, more than me. I try not to think about that stuff much. I try to just be sort of myopic in my attempts to do the part properly, and invest in it, rather than comment on it, you know what I mean? You’re someone on the Stratford stage who always seems to be having a particularly large amount of fun, as opposed to taking it deathly seriously. Is that something you’re conscious of? Wow, I’m really glad somebody’s getting that! Yeah, it is something I’m conscious of. I love what I do. I mean, I work hard and I take the work we do seriously, but I don’t see myself seriously. And what we do is too much fun to waste with too much anxiety. It’s anxious-making to do it, and it’s anxious-making to put yourself out there in front of people, but it is also a really pleasurable experience to be able to do it for a living, and to be able to do it fairly regularly as I’ve been lucky enough to be [doing]. I’m not going to waste it by worrying about it all the time. If you wanted to have a real job, you know, you would do that. A big reason we do this is because we love it and enjoy it and are drawn to it. I feel like I’ve been given a lot of opportunities that a lot of people haven’t been given, and I feel like, if nothing else, I’m responsible for enjoying those opportunities, not wasting them or frittering them away with anxiety. If feel like I’ve a responsibility to make the most of them, and to me, it’s just to make sure I’m enjoying when I’m out there. ‘Cause who knows when it’ll end, too? Could all dry up tomorrow. In 2011 you played Orsino in Des McAnuff’s anachronistic Twelfth Night. I always think that character’s a little underwritten despite being really important to the plot. How did you flesh him out? Well that’s exactly what—that’s a very good description of Orsino. He is, he’s important— I don’t know if he’s underwritten– but he’s only in four scenes. It’s a part that everybody knows, and it is important, he’s talked about all the time, but he doesn’t actually talk himself a whole lot. I have a great relationship with Andrea Runge [who played Viola], so that wasn’t hard. It’s not hard to fall for her, so that part of it—because, you know, you only have four scenes—that part of it has to move quickly. And two of the scenes are pretty short, but it wasn’t hard to do that with Andrea—she’s sort of, like, my favorite, so I love to [act opposite her]—that was easy. And then you just have to do the work and try to make it evident when you’re out there. Because Orsino kind of jumps every time we see him. A lot happened to him since we’ve last seen him. So you have to do that work, and know what it is that’s happened to him between those scenes. Because a lot of what happens to him doesn’t happen onstage—it happens off stage. And it’s kind of personal and private. So you just have to wear those things with you, and hope that the audience follows, without it being too overdone. You just kind of have to be there, and audiences are generally smart enough that they follow that journey. 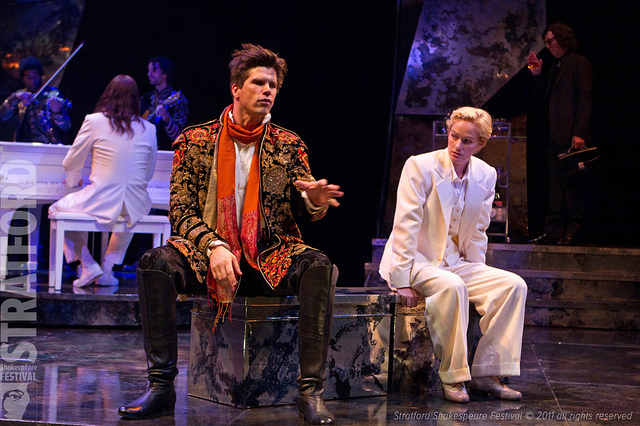 This year, you did Cloten [in Cymbeline], another cerebrally challenged character, but this time a bad guy. You don’t seem to be cast as a lot of villains. How did you approach that? Well, I have to be honest with you, I really think I’m better at bad guys than people think. 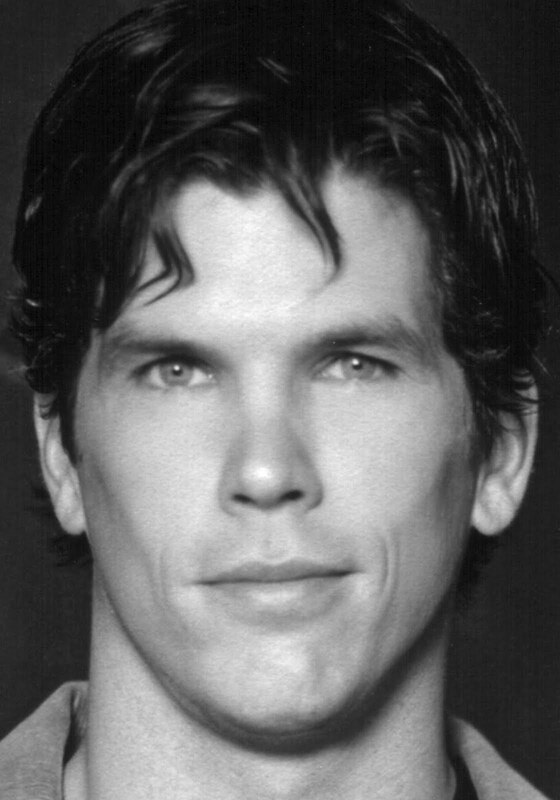 I played a bad guy in Take Me Out, at CanStage, about six years ago, and that was like the most fun I ever had, it was such a great part. You just approach it the same as you would anybody else. You try not to comment on him too much. I mean, [Cloten]’s such a lunkhead [Laughs] but, you know, he doesn’t think he’s a lunkhead. He thinks he’s quite something and quite a catch. You don’t really approach it as a “villain” per se, because he’s not really the villain of the piece—I guess Iachimo and The Queen are more villainous. He’s more, sort of, a comic villain. It’s a unique part. It’s hard to articulate exactly what you do. I don’t do a lot of work consciously. A lot of it just happens as you’re there, you know? I noticed that my chin was tucking in a bit, and I was walking a bit like a Neanderthal—that just sort of happened. I didn’t go home and write that down. And that’s generally how those things work for me, you just try to listen as much as you can to what’s going on, and who’s around you and who’s talking to you, and in scenes with you, and I try to take it from them. Do you ever find inspiration for your characters in other performances you’ve seen? Yes. Absolutely. I will steal from anyone. [Laughs]. Anytime. I think subconsciously as an actor, you often register other actors, or even other people—things they do—and they get filed away as a kind of interesting way of dealing with things, and then sometimes, maybe ten years later and even unconsciously, your brain accesses that again, and puts it into something you’re doing. I think it’s more like that, I don’t think it’s as obvious as “oh, I’m going to steal this guy’s performance”. It’s more that your brain sort of stores these windows into people; you observe people and you observe actors and you kind of calk what a window into their soul or their mind is. Then, hopefully, that stays in your hard drive in your head, so you can pull from it at times, when you’re trying to deal with a character’s unique demands and unique needs. It’s probably not as concrete as “I just imitated John Malkovich, here”. In a complete 180 from Cloten, your other repertory part last season—which is actually what your My Theatre Award nomination is for—was Cornelius in The Matchmaker. What was it like stealing a show so thoroughly from Tom McCamus and Seana McKenna? [Laughs]. That wasn’t my plan. That’s very nice. But I think it’s sometimes you get lucky- your part fits you well, and your fellow performers are pretty generous about letting you have moments and things that maybe make you shine. You can’t do it by yourself. It never works that way. I have to say, Laura Condlln was a big part of that. She’s one of the most generous actors I’ve ever worked with and she’s a fantastic acting partner; she really helped me. And it wasn’t hard to fall in love with her. She’s really generous about her work as an actor, and feeding her fellow performers, and I think that was a big part of it. Sometimes you can get into a show with somebody that’s a comedy, and it can feel a bit like, “We’re all going to do our ‘bits’ here. And my ‘bit’ is funnier than yours.” And I didn’t feel that with Laura, ever. Or with Tom or Seana. And that part of it too—it was a pretty generous group of people to do that with. I’d never worked with Laura before. It was my great pleasure, I hope to again, soon. She’s not back at the Festival this year, but soon enough, I hope. What have been some of your favorite roles you’ve played? Um… [pauses] I played a guy named Shane Mungitt in Take Me Out at CanStage about five or six years ago, he’s just a redneck lunatic. That was great fun. I really liked playing Louis Dubedat in The Doctor’s Dilemma at the Shaw Festival. That’s a great part; I was very lucky to do that. 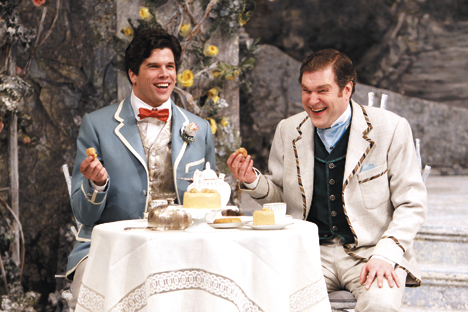 Graham Abbey and I played the brothers in Long Day’s Journey Into Nightin Winnipeg, about five or six years ago. I played Edmund. That was great. I really enjoyed that—I really enjoyed doing that with Graham. Those are ones that come to mind, anyway. There’ve been other ones too. I’ve been very lucky. Oh, and playing Algernon in Earnest is a pretty great, fun thing that everyone should get to do. That’s a pretty fun tear to go on. Especially when you get to do it with such an accomplished group of people as I did. That was a pretty rare treat too. Do you get to see many of the plays at Stratford each year? Did you have any favorites or any performances that really stood out to you last year? Yeah, there was lots. I thought that Elektra was fantastic. I really liked that. I thought it [showed] amazing innovation. It was like nothing I’d ever seen before. I was really proud we did that. I was lucky too, I felt like both shows I was in were pretty good. Not because of me, but when I watched the other parts of the shows I was in, I was very impressed by those. And when I saw The Little Yearsagain this winter at Tarragon- which we originally did at Stratford the year before—boy, was that ever great. I loved that too. I thought that was just fantastic. Tell me about the roles you’re playing this coming season. You’re back with Graham Abbey doing The Three Musketeers, right? Yes. 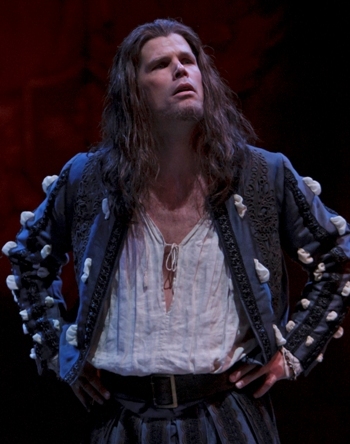 I’m playing Aramis in The Three Musketeers, and I play Roderigo in Othello. 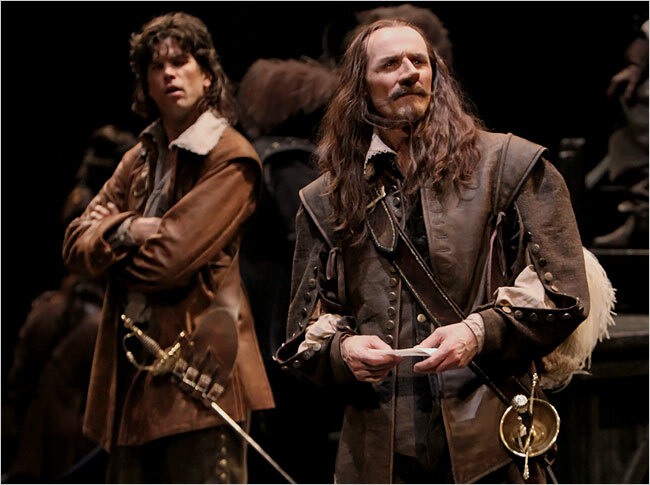 Three Musketeers, I’m hoping will be a lot of fun—I’ve never worked with Johnny Goad before, but Johnny Goad and Graham and I are The Three Musketeers. That should be a great time. I know Johnny a little bit and I like him very much, and he’s, obviously, a terrific actor—as is Graham. So that will be fun. I’ve never worked with Miles Potter before as a director, so I look forward to that a lot. I’m hoping that will be about as much fun as we can make it. And then, playing Roderigo in Othello is a great part. I love that it’s maybe not the part you might think of me for right away. I love that that’s happening to me at Stratford now, I think Cloten was a good start of that. And I like that they’re thinking of me for weird things, not just, you know, guys who have all their hair. I like that trend a lot. I like that my grooves at Stratford aren’t getting too deep, where I’m only starting to be one thing—that’s good to me. I hope to be allowed to stay an actor there. I wrote a dream cast for last season before the press releases went out and I actually had you pegged for Cloten. Oh, you’re kidding! Wow. Well, good for you. I think you and Antoni Cimolino were the only two people who had that in mind, but, I’m glad he did and I’m glad you did. I really loved it, and it was good for me to do there too. I hope it kind of made them see that I’m interested in doing other things too. Do you have any dream parts in mind that you’d really like to do? Not that I’m going to talk about publicly, no. [Laughs]. Well, I think sometimes you have to be careful with that stuff. I don’t mean because I don’t want people to find out. I mean, sometimes your ego can delude you into thinking you’re really perfect for something that maybe you aren’t. Sometimes my ego has been hurt because I’ve been offered something that I didn’t think I was right for, or I didn’t think was very interesting, and I’ve been dead wrong. The director was dead right, and it suited me to a T and I had a great time. So, to a certain degree, I’m willing to offer myself up to fate and see what it has in mind for me. I generally trust the people who are in charge of my immediate future at Stratford right now, so I’m sort of more curious to see what they see me doing. I’m willing to trust that right now. So far the path has been pretty great to follow; so, at this point I’m sort of willing to go along with their ideas. Do you have any clues about the upcoming productions? Clues? No, I really don’t. I don’t know much about what’s going to happen. I haven’t cut my hair since the last week of The Matchmaker, in hopes that I don’t have to wear a wig for The Three Musketeers [Laughs]. That’s the most I can give you, at this point, that I’m desperately hoping my hair will be long enough that I don’t have to do that. In the off-season you did The Amorous Adventures of Anatol at Tarragon. Oh, it was great. A very nice group of people. I’d never worked a the Tarragon before- it’s such a Toronto institution, and I’m not really part of the Toronto community in the same sense that a lot of people are, and it’s really a pleasure for me to get to work there. I really enjoyed it. It’s a lovely place to work, and I’ve enjoyed it very much more since Morris Panych [the director] is always one of my favorites to work with. I get great joy out of working with him everyday, and that was the case again this time, it’s been a real treat. Those were pretty great questions. Thank you for putting such thought into this! It’s great to have you take such interest, and do so much to promote what we’re doing. It’s nice to know your work is being seen and understood for what you’re—at least, most of the time—attempting to do.